1LE offers one 20-inch wheel for the 2014 model year and engineered to the highest standards. 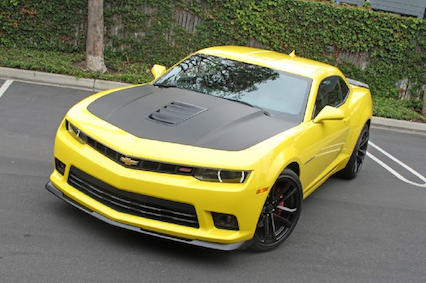 2014 Chevy Camaro 1LE, which features a new, more-streamlined front fascia, Hood and heat extractor that also moves air to help create down force. The reworked Rear fascia has all new trunk-lid, Spoiler, Tail lamps and lower Fascia. The 2014 Camaro 1LE not only stands out from its previous model, but hands down is a serious contender for this model year. We truly believe the 1LE will soon have a collectibility standard and will be low in production numbers. This in turn will make the Camaro 1LE a prized vehicle in the years to come. 2014 has some small enhancements to the Camaro's front and rear alter the overall look substantially. Chevy worked on enhancing the car's aerodynamics by reshaping the front end. The upper grille is narrower while the lower grille is larger. But overall length, width and height all remain the same as before. In back, the taillights are the most striking change; they go from a blocky design to one that is razor thin. These lights were the previous car's most talked about attribute because they were mimicked on other Chevy models. SS/1LE with 1SS with Black interior,so these are Black "NON" heated seat cover numbers.